I started Final Fantasy V this week, and MAN, what a week it has been! The game’s clock says I’ve only played about 6 hours, but I swear it feels like I’ve been in that world for dozens. It is immersive and engaging, and I’m finding myself quite invested in the characters. I’m honestly surprised by how overshadowed the game gets by its bookends of IV and VI. Obviously I haven’t yet reached Final Fantasy VI so I can’t make those comparisons just now, but the way things stand right now I’m SO much more invested in FFV than I was in FFIV. 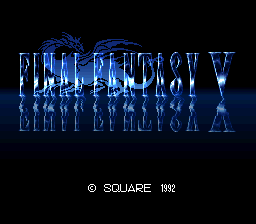 Perhaps that’s unfair since I had to stagger my time with IV so I never had a chance to lose myself in it, but I still had plenty of frustrations with the game that haven’t been an issue thus far in FFV. There’s still time for that to change, but right now it’s smooth sailing. One of many points I’m enjoying is the consistent party. Final Fantasy II gave me a constantly rotating 4th party member, while Final Fantasy IV swapped out pretty much everyone but Cecil throughout the entire game. Every time I would get used to my team and grind them all to respectable levels, the games would turn my world upside down all over again. Final Fantasy V hearkens back to Final Fantasy III, giving me one constant group of four, with an improved job system to boot. Two points come from this, the first of which is the characters. While FFIV had a large cast full of the most interesting characters the series has yet seen, there were almost too many of them. Their stories came in segments, and some were straight-up underrepresented and seemed kind of pointless in the end. Having a core party of four characters has allowed FFV to flesh each of them out much more fully, and I’m not even 10 hours in! While amnesia is an overused and uninspired trope by today’s standards, I’m eager to see who Galuf is and what his role in this world was/is. Then there’s Lenna, the princess of Tycoon who looks to save her father and kingdom, while learning about herself throughout the game. And what about Faris, the coolest one of the lot? A female pirate (perhaps inspired by FFII’s Leila?) who almost seems ashamed of being a woman, there’s much more to her than meets the eye. There’s definitely a connection between she and Lenna, yet to be 100% confirmed, and I see her going through the most substantial and significant changes by the game’s end. Bartz is the game’s supposed central protagonist, but interestingly enough he’s the one we know the least about. We meet him in the beginning as he travels the world atop Boco, his chocobo companion. 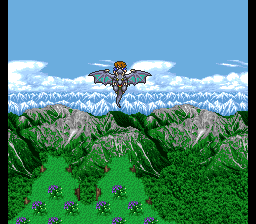 He bumps into Lenna and Galuf at the site of a fallen meteor, wherein they become a party and move on from there. I also imagine there’s more to him than meets the eye, but right now he’s reminding me of Final Fantasy XII‘s Vaan. He may not be the most interesting, but the rest of the characters gravitate around him. He’s the driving force, the one that makes the team a team. Again, though, I do think there’s more in store for him. We’ll see. The second point I wanted to touch on from earlier is the job system. 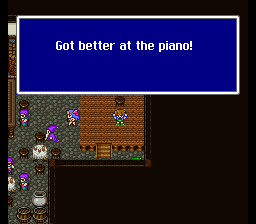 Much like Final Fantasy III was basically an upgraded Final Fantasy, FFV is pretty much an upgraded FFIII. There’s a core team that sticks together, but they can be customised with whatever jobs and classes you think would best fit the situation. The job system has had a fair overhaul this time around though, as the jobs themselves level up aside from your character levels, and with each job comes an exclusive set of abilities. Thieves can Steal, and White Mages use restorative and defensive spells, as you would expect. The higher your particular job level, the more abilities you unlock. Thieves can learn to dash in towns and dungeons, and see hidden passages; White Mages’ spells increase in effectiveness as they become more adept at their trade. When you have a character active as one job, they have all the respective abilities. The kicker is that if you reach a minimum of level 1 for any job, you then unlock abilities that can be used under any job. For example, I’ve currently got Bartz set as a Blue Mage, but first I made sure he was learned as a level 1 White Mage. So while he’s got the tricks and skills of a Blue Mage, I’ve also equipped him with level 1 white magic, making him a back-up healer in case of emergencies. I reckon there will be more than 20 jobs by the end of the game, and each one can unlock at least 3 or 4 separate abilities that can then be equipped (just one at a time) upon changing your job. I make it sound complicated, but it’s actually quite simple in execution, and it adds that extra layer of depth and customization that results seemingly endless possibilities. I love it so much. Now hold up, did I just mention Blue Mages? I certainly did! 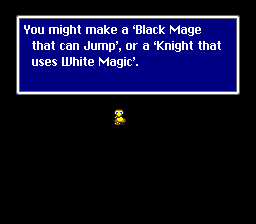 I had all but forgotten about that class, as it is nearly always outshined by Black, White, and Red Mages. Basically, a Blue Mage can learn enemies’ attacks used against them and remember them for later use. I’ve had Bartz as a Blue Mage since the beginning, and so far I’ve only learned four skills. Unless you’ve got a walkthrough telling you which enemies yield which skills (which I do not), the Blue Mage can be a difficult class to enjoy and master, as you essentially have to let the character get hit by any and all attacks from any and all enemies. Even so, I love the notion of using enemy attacks against them, so I’m willing to slog through a bit to learn those special skills. If you think this class sounds familiar, that’s because it paves the way for Quistis in Final Fantasy VIII, Quina in Final Fantasy IX, and Kimahri in Final Fantasy X, as well as Final Fantasy VII‘s Enemy Skill materia. Even in those games I enjoyed the challenge of finding new attacks that I could make my own, so experiencing the Blue Mage’s introduction is such a treat for me. I know this is pretty long-winded, but that’s what happens when you start a new game and REALLY like it! Some final notes before I wrap up for this week: Travelling by dragon is the best way to travel; so much more satisfying than dumb ol’ airships. The ship graveyard I passed through reminded me of FFVII’s train graveyard; just another way VII pulled from previous games in new ways. Finally, Syldra‘s death (whoops, spoiler) was the most emotional death I’ve come across in the series thus far. The Loch Ness-ish creature pulls your boat after the wind is gone from the world, and her assistance is invaluable. She saves the party’s life, and Faris has a touching and heartbreaking final moment with her that pulls on the heartstrings. I really hope her death isn’t ruined later by being a sham. So that wraps things up for this week. I’m elated to have enjoyed Final Fantasy V so thoroughly up to now, and I truly hope it keeps up. I’m taking a break from including tweets in these updates, but remember you can follow me on Twitter @zacharyplyons for my live tweets, and search for previous updates with the hashtag #RoadtoXVin15. Time for an updated progress chart!